As Donald Trump’s nightmarish campaign winds on and on and on, a few questions keep arising: are we really stupid and/or racist enough to elect this moldering Cheez-It of a man? (Yes.) Is Trump’s hair a costly weave? (Possibly!) 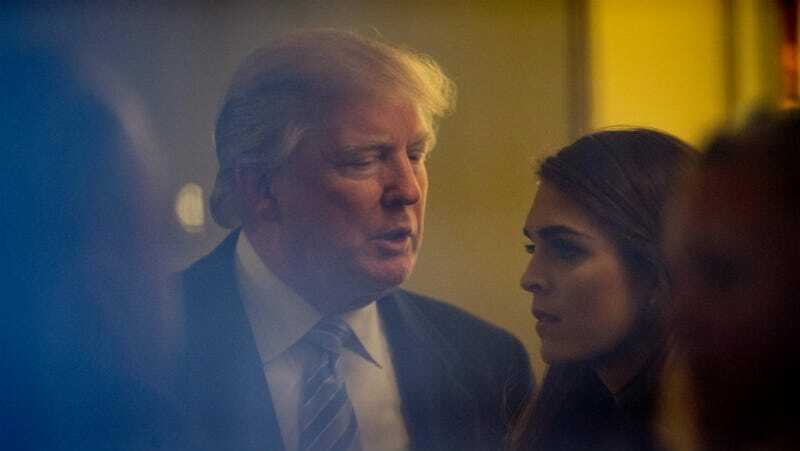 And what is the deal with Hope Hicks, Trump’s ostensible press secretary, who is rarely seen, barely talks, and is just 27 years old? The always delightful political journalist Olivia Nuzzi, usually of the Daily Beast, explored that last question for GQ. It is a wonderful and perfect piece and it fills us with joy and alarm in equal measure. To review: after graduating from wealthy Republican finishing school Southern Methodist University, Hicks went on to do PR for Ivanka Trump’s fashion line. She never worked in politics before joining the Trump circus. She is not listed in the ten highest-paid employees in the campaign (most of whom are men). The only time she’s really made any news herself is for accidentally emailing something to a Politico reporter. Please look at this delightful list of non-facts that Cosmo assembled about her, after she “politely declined” an interview request. While Hicks is often eager to please, she doesn’t mind upsetting the media and harbors no reverence for the civic duties of a free press. When reporters send her questions, she’s often irked—convinced they’re playing detective merely to irritate the campaign. She’s seemingly unaware that they might just be vetting a potential United States president. Often she doesn’t respond. By way of contrast, let’s consider Hillary Clinton’s press secretary Brian Fallon, who tweets often, goes on TV with some regularity, and gets into polite tussles with reporters about whether his candidate is actually making herself available to the press. Meanwhile, here’s a parody Twitter account making fun of Hicks for her penchant for not responding or declining to comment. Lewandowski and Hicks also got into a public screaming argument in May, which honestly makes me like her better. Kylie Burchell, Hicks’s lacrosse coach, recalled her as one of the only players to abide by a no-alcohol policy. “I think the girls were annoyed at her a little bit,” she said. “She was trying to be a leader. She was showing by example what to do.” She wasn’t always so earnest, however. In her senior yearbook, she mistakenly attributed the words of Eleanor Roosevelt—“The future belongs to those who believe in the power of their dreams”—to Jimmy Buffett. I, for one, am shocked to learn that the only woman in Trump’s inner circle is prized for her ability to be docile, pretty, and very, very quiet. Never would’ve guessed.